E has played with play dough a lot this summer. Seeing her made N want the play dough, too, but since he’s really into eating it, I had to keep him away from it. Even though we use homemade play dough and I’m sure a little taste won’t hurt him, I was still weary of all the salt that’s in our recipe and just couldn’t watch him put it in his mouth. It made me try to think of a way to allow him to explore and play with play dough without ending up with an upset tummy. 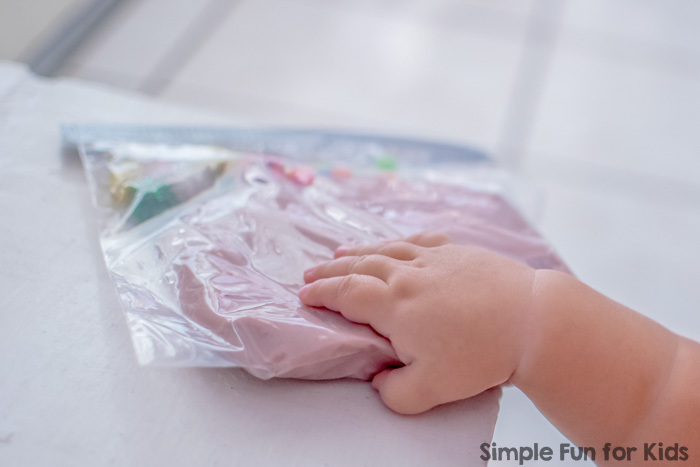 I came up with a quick and simple solution: I made him a Play Dough Sensory Bag! 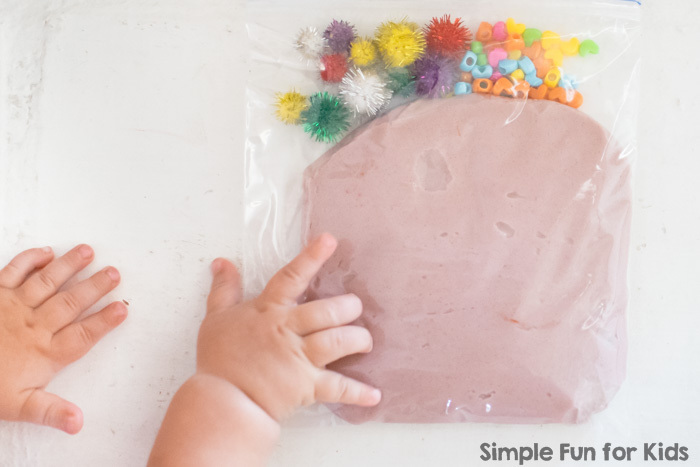 While I was at it, I threw in a few other non-baby safe items for added texture and color, but it still only took a minute to put together and N really enjoyed it! 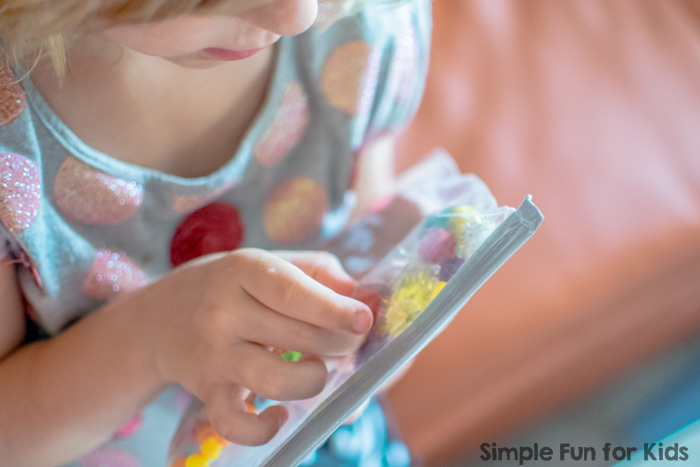 Sensory bags usually come together pretty quickly and this one was no exception. I put in play dough, glitter pompoms, and heart shaped beads. I just put the items next to the play dough so they could work their way into the play dough as N played with the bag. I flattened the play dough to fit the bag, but you could make a ball. That would probably be even more interesting and it would flatten out on its own over time. N enjoyed squeezing the play dough in the bag as best he could. As usual, E didn’t want to miss out and spent some time with the bag, too. 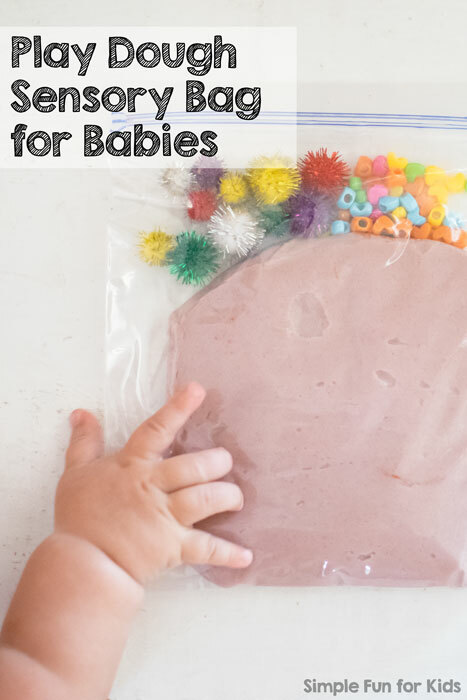 Learning and Exploring through Play has a whole Guide to Creating Sensory Bags!